(AUSTIN) — Projects designed to blunt the impact of the next storm that hits the state are on hold because federal officials haven't said how related federal disaster relief funds may be spent. 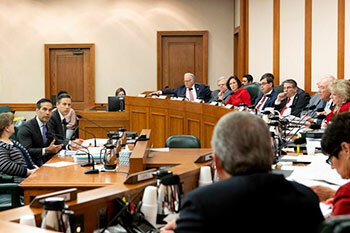 That's what Land Commissioner George P. Bush told members of the Senate Finance Committee at their hearing Wednesday. He's submitted a letter to the president detailing his agency's issues dealing with the Departments of Housing and Urban Development and the Office of Management and Budget, who are blaming each other for the hold-up in writing spending rules. "It's really a message to Washington D.C. that they need to get their act together," said Bush. "We've come close to a year anniversary upon Congress's action to appropriate for mitigation dollars." He told Senators that his agency has offered staff assistance and even submitted draft rules to federal officials, but to no avail. The projects awaiting funding include levees, dams and seawalls to lessen storm surge damage. Texas Land Commissioner George P. Bush briefed the Finance Committee on the General Land Office's efforts to help Harvey recovery. Another key piece of hurricane recovery managed through Commissioner Bush's General Land Office is repair and rebuilding of housing devastated by Hurricane Harvey. The GLO contracted with local governments and third-party contractors to administer $2.7 billion in housing aid. This includes $1 billion in funding for the Housing Assistance Program, which allows single-family homeowners to apply for up to $250,000 for repair, rebuilding or flood prevention, as well as an additional $250 million for multi-family residential aid. The first program began operation last November, and has recently completed its first home rebuilds. "We look forward to delivering thousands more homes," said Bush. "We want people to apply to these programs, visit our website and talk with their county judges and mayors about it." There are nearly 3000 applications for housing assistance already pending. Applications for aid and information on eligibility as well information on other disaster aid programs can be found online at recovery.texas.gov. In discussing the various funds and rules regarding those funds, all involving multiple entities and jurisdictions at all levels of government, more than one member expressed confusion at trying to keep track of it all. There are too many unanswered questions around the estimated $25 billion in aid money appropriated for Harvey relief, said Senator Charles Perry of Lubbock. "It concerns me when you have this much discussion about pools of money that nobody really fully understands where they're at, what they're doing and whose oversight they're under," he said. Committee Chair Jane Nelson of Flower Mound expressed similar concerns. "I'm more confused now than I was when I walked in this morning," she said. "We have, what, a hundred and some days left in the session and we have to decide how much money is available, what are we going to spend it on, and how we can spend it most efficiently." Nelson created an ad hoc working group comprised of three members, Senators Joan Huffman of Houston, Lois Kolkhorst of Brenham and Robert Nichols of Jacksonville, all of whom represent areas affected by Harvey. Nelson created an ad hoc working group comprised of three members, Senators Joan Huffman of Houston, Lois Kolkhorst of Brenham and Robert Nichols of Jacksonville, all of whom represent districts affected by Harvey. They are tasked with studying the issue, determining exactly what federal aid funds are available, and how they can be spent to help on-going recovery efforts and fund projects to reduce the severity of flooding when the next storm impacts the Texas Gulf Coast. 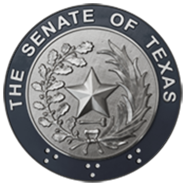 The Senate will reconvene Friday, February 1 at 11 a.m., when the first non-budget Senate bills will be assigned to committees.